The Wars series has long been enjoyed by Japanese gamers even before we knew about it. And when it finally breached America in 2001 as Game Boy Advance’s Advance Wars, it sounded the drums of war for gamers all over the country. Advance Wars was a success, and with its sequel, Black Hole Rising, the wars series has become the defining title in military strategy games. 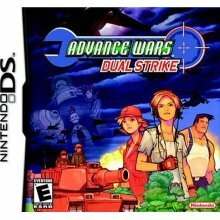 When word was out that Advance Wars was invading Nintendo DS territory, fans where expecting a lot of things. Well, they got what they wanted. The gameplay is pretty much the same which makes it comfortable and easy to get in to. It is still a turn-based battle over a top view map. And generally, you still defeat your opponents by racking up your troops and taking them all out, or capture the enemy HQ. Together with a few you already know, Dual Strike comes with 9 new COs (commanding officers) to the roster, each still having their unique abilities in battle. This time around, instead of being able to bring 1 CO in combat, you can now bring 2. This is makes the gameplay even more deep as you can pair certain COs to pull off a strategy, to make you more versatile, or to cover up each others weaknesses. Dual Strike comes with features like new units and modes making the game more interesting and refreshing. Multiplayer has two modes in Dual Strike, versus and link. In versus mode, you and your buddy can just take turns making your moves with the same DS. In link mode, you can link up to eight people with one DS each. Dual has made an impression as one of the best military strategy games for the Nintendo DS. A sequel is coming out named Days of Ruin, which you could find very different from the previous titles. But Dual Strike takes the recognition by being the first of its kind in Nintendo DS.